Discussion in 'Automobilista - General Discussion' started by lucaf, Jan 28, 2019. Honestly, I love this game, but...The opening screen with the series selection is nonsense. On top of that, it works poorly. Its difficult to identify which serie is selected, and changing the selection leads to big delay which makes you wonder what is going on, is it jammed or what. It feels like a joke without purpose. All we need in the opening screen is: Single Race, Multiplayer, and Time Trial. Please, why this can't be simple like that? Then under Single Race there could be "Test Day" and "Championship" (I don't event know how Championship works, for me it doesnt give anything). And if user selects Time Trial, then show that list of series but the selection should be clear and smooth. Think a new user (like me) who buys this game, and gets excited of the bombastic intro....which then drops you to that disastrous Series Selection screen. It is really confusing. Thank you for reading and expressing your opinions by rating. In case I have missed something, I would be happy to read/hear/know how do you feel the series selection is a good choice in the user interface? I pretty much like it the way it is. You choose your series you want to race with/in and there you go. Everything is saved in the background, so that I don't have to set everything up from zero when I change the series. If you want to organise a track day, just choose all cars and tracks and do a practise session with the cars you want. It's very simple and straight forward if you take a bit of time to study things. Afterwards it will be a matter of seconds to set things up. About loading times if you click on a series: I think that certain files are prepared in the background when you click on a series icon; because after this initial "delay" - as you called it - things run pretty fast (at least to me). Loading times (to get on track) are okay, as well IMO. I've gradually come to the conclusion that Automobilista's UI, especially the car set-up area, is a model of efficiency. There are no animated menus to waste time or tax a graphics card. There are no hidden areas that must be accessed by a drop-down menu or similar. Most importantly, the number of mouse clicks is minimal. Count the number of clicks it takes to arrange a race in rF2, Assetto Corsa or Project Cars and then adjust a car set-up before getting on the grid. 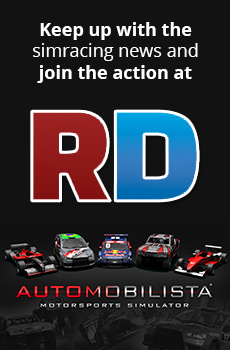 Then try the same with Automobilista. AMS has one page for race options and two for car set-ups. Only Raceroom keeps things as simple (the new multiplayer UI is good), but it offers fewer car tuning options. The Content Manager mod for Assetto Corsa makes things quick and easy once the user has created a few presets, but even that is (understandably) festooned with pages and pages of options. Reiza kept things simple and efficient. I wish more UIs followed their lead. Everything is saved in the background, so that I don't have to set everything up from zero when I change the series. 1) The selection of current series would be more perceptible. 2) A hourglass mouse cursor would be displayed during that considerably long delay between series selection. 3) When "All Cars" is selected, its bad UI design to change the Time Trial button into "Unavailable" box. More correct UI behaviour would be, if you click Time Trial, you get a msgbox "Please select series first". Now if you are new to the game, you feel quite pissed when you don't understand which action brought that "Unavailable" button there. @Scraper, I think you went bit offtopic, but to not sound overall negative with my comments, I want to agree with you that the car setup UI is very good and also other parts of the game are very well designed. @lucaf I did indeed go off-topic somewhat. You're correct that AMS, like most sims, is initially daunting. People who are new to the game need instructions and pointers that are explicit. The manual is helpful, but there really should be a link in the game to open the manual. Like you, choosing the "All Cars" option for the first time left me waiting and worried that the game had crashed. I know now that it will take a few seconds to load, so that worry has gone; I agree that an hourglass mouse cursor or one of those dreaded "Loading..." messages would reassure new users. If Reiza give us one more update, as seems likely with the eventual appearance of the rFactor DLC and a possible McLaren vehicle, don't expect major revisions to the UI. (I'm hoping the multiclass car behaviour gets an improvement.) The less time spent on AMS, the more time spent on Tractor* Extreme 2019. Yeah, I think UI fixes of this scale are relatively quick to implement, thats why I dared to open the discussion. But nevermind, the game is great and I will keep on visiting it constantly anyway. The most important thing to me is AI strength and aggressiveness/aggression or how it is called. Because I always struggle to remember what strength and aggression to choose. The car you drove the last time in this series and the opponent data are saved. Track and settings are not saved per series but are always the ones you chose the last time you played. That's more than enough for me. This way I can easily re-arrange a setting I liked/found relaxing. I see you've obviously run out of things to moan about!! !